For college basketball fans (and, particularly, BYU fans), it’s the Game Of The Year — nay, The Game Of The Century — and the PB&J Report boys are here to break down the impending BYU-San Diego State slugfest from every possible angle. Listen as the crew analyzes both teams’ strengths and weaknesses and makes their (extremely educated) picks for the big game. Also, they throw in a few thoughts on Sunday’s NFL playoff games and next week’s Super Bowl to boot. Now, who doesn’t want some of that? Enjoy! Historically the first two weekends of the NFL playoffs are two of my favorite weekends of the year (topped by wild card Saturday — is there a reason this isn’t a national holiday yet?). This year didn’t break that trend as last weekend saw the Jets, Seahawks, Packers and Ravens all win, arguably all upsets except maybe the Ravens. Part of what makes the NFL so exciting is the parity, and at no time is this more apparent than during the playoffs. It’s astounding to me that NFL GMs have yet to figure out the wide receiver position. The Ravens came into the season with three top receivers — check that, three former top wide receivers. Derrick Mason, Anquan Boldin and T.J Houshmandzadeh were all number one receivers at some point in their careers — Mason with the Titans, Boldin with the Cardinals, and T.J. (no way I’m typing that name again) with the Bengals and later the Seahawks. All three were the top receivers on their teams, but for various reasons their former teams cut ties with them and they all landed in Baltimore. When teams decide to go their separate ways with a wider receiver, it has historically been a bad sign. These same situations seem to happen every year, and yet GMs continue to throw money at these players. Look at Roy Williams in Dallas, Randy Moss in Minnesota or Terrell Owens on every team he’s ever been on (which at this points seems to be approximately half the teams in the NFL). Today in their game against the Steelers, the Ravens’ receiving core repeatedly dropped passes, costing them scoring opportunities. This was typified by the Ravens’ last offensive play when, trying to drive and tie the game, Joe Flacco threw an almost perfect pass on 4th and 19 to Houshmandzadeh, who had run a deep curl route. Houshmandzadeh was past the first down line when the ball hit him right in the numbers, and then promptly fell through his hands and hit the ground. Maybe now Ravens’ GM Ozzie Newsome can see why Seattle (who, by the way, isn’t exactly fielding the ’01 Rams receiving core out there) chose to cut him, knowing they would still have to pay him $7 million, rather then have him on their team. Think about that — they paid him 7 million dollars to go away. Sound like a guy you want on your team? Apparently Ozzie Newsome thought it sounded awesome, and for that reason he’ll be watching the AFC championship game on his couch. Look, I know Big Ben has had his off-field issues — a motorcycle crash, repeated drunkenness, an appearance on Shaq Vs. and the fact that he’s a complete pervert have all greatly hurt his public image. In all that, we may have lost the fact the guy has won two Super Bowls, and is one of the most clutch quarterbacks we’ve seen — maybe ever. The guy just wins. He’s got that last-minute greatness DNA that Peyton would kill the third Manning brother for. Today, with the game tied and just over two minutes remaining, the Steelers were looking at 3rd and 19 and, if they failed to convert, they would be giving the ball back to the Ravens with enough time remaining to put together a drive and win the game with a field goal. In this situation most quarterbacks are looking for that pass that just gets them the first down, because the defense is trying to prevent a 20-yard play. Oftentimes quarterbacks will check down to someone on a short route, hoping they can break some tackles and fight for a first down. Not Big Ben. He set himself up in the shotgun, received the ball, took five steps back, calmly looked at his options, and then flung the ball 55 yards down the right sideline. The ball was perfectly on target to a streaking Antonio Brown who caught the ball and stepped out of bounds setting the Steelers up close to the goal for a game-winning touchdown. If you go back and watch that play again, Roethlisberger throws the ball long before Brown is past the defense — in fact, to anyone else watching it doesn’t even seem clear that Brown will be open. The fact that Roethlisberger was able to anticipate where his receiver would be in that situation, and then throw the ball with such precision 55 yards downfield, is absolutely incredible. If you haven’t seen the play again, go back and watch it from all the angles. In that situation, I’m not sure there’s another quarterback who makes that throw. The fact is, despite his obvious character flaws, Roethlisberger is a born winner — and if I was a coach I would want him on my team. I’ve been on the Aaron Rodgers bandwagon for awhile. I had him on my fantasy team last year and was really impressed by the numbers he put up week in and week out. This year I’ve been impressed with his toughness, fighting back from two concussions. What he did against the Falcons tonight was an absolute clinic. He diced up their secondary with amazing precision, he escaped their rushers with surprising speed and agility, and he led the Packers with all the intangibles you want to see from your starting quarterback. His mechanics, accuracy, arm strength, mobility, reads, leadership and guts were all of the highest caliber. Let’s put it this way: Of all the NFL games I’ve seen this year, if I had to pick one game to show a young quarterback to say, “This is the way you play the position,” I think it would be this game against the Falcons. In his post-season career, Rodgers now has a 10:1 touchdown-to-interception ratio. He beat the Eagles (many experts’ pick to win the NFC) on the road last week, and he beat the number one-seeded Falcons this week. After what we’ve seen the last two seasons and (in particular) this post-season, I think it’s time we officially move him into the “Top Three QBs In The League” discussion. Considering the truly lackluster efforts of Manning, Brees and Vick this post-season, can we say Aaron Rodgers might be the best quarterback not named Tom Brady or Ben Roethlisberger? Right now, if I had one game to win, I would pick Brady, then Rothelisberger, but after that I’m pretty sure I would take Aaron Rodgers. He’s that good, and a seemingly decent guy to boot. Rodgers spent three years patiently waiting in the wings for Brett Favre to take his texting talents elsewhere, and then the next three years flying under the radar in Green Bay. Hey Aaron, you’re on everyone’s radar now — pretty soon you may even have Rachel Nichols camping out on your lawn. It’s that time of year again — the best time of year. College football is finishing strong, the NFL playoffs are heating up and basketball season is really starting to get interesting. Sports fans will think back on these times and salivate in July when all they have to watch is baseball, baseball and more baseball. As such, the PB&J Report crew gather to discuss the latest developments, including Jimmer Fredette’s 47-point explosion against Utah, Auburn’s national championship squeaker and the upcoming weekend slate of NFL games. Enjoy! Back from their holiday hiatus, the PB&J Report crew return to the palatial Rhombus studios for a look ahead to the upcoming 2011 sports year — including the conclusion of the college football season, the impending NFL playoffs and the ominous rise of the hated Miami Heat. What does it all mean? We’ll find out in the next 12 months. Enjoy! You’ve taken part in this argument before. It’s everywhere. You can’t avoid it. A decade ago, it was even somewhat enjoyable. We would analyze the stats like pundits, spout our opinions, and fantasize about the hypothetical. How would one of these non-BCS schools do against the big kids? Do non-BCS schools belong in the championship picture? Since there exists no playoff in college football (although their basketball counterparts seem to pull it off just fine), fans of the game live and die by this kind of conjecture. This age of parity turns the heat up on these discussions to a full-blown boil. Competently run programs like Utah, TCU and Boise State (and until recently BYU) annually produce quality teams that stir the BCS pot. To complicate things further, the BCS has been around long enough to not only betray its own futility, but also render our arguments pointless. To illustrate, let’s run through two generic conversations inspired by real life events. I’ve volunteered Jake Welch of PB&J Report fame to participate in these hypothetical conversations with me. Here we go. Notice that Jake (representing all of us) uses the same logic of transitivity that has become the all-powerful measuring stick of college football rankings. In economics, we use the same logic to figure out which types of goods consumers will buy. Essentially, if a person prefers A over B and B over C, then that person must also prefer A over C. Notice further that Jake also takes into consideration margin of victory of common opponents and “style points” in order to determine which bundle/team was hypothetically preferred/better than the other. While transitivity is a fine way to determine relatively stable consumer preferences, it turns out it is a really bad way to determine who would win a football game. (If you’re not buying this assertion, please refer the entire 2007-2008 college football season). Nauseous yet? Some interesting points about this second conversation: First, this is just a minimal example of the conjectural firestorm that went on after both of those BCS bowl victories by Utah and Boise State. It was out of control — small conference fans demanding that their teams get respect and automatic bids; large conference fans playing damage control and diminishing their losses by saying it was bad luck and that the teams they were facing were so pathetic they underestimated them and didn’t try hard. Second, the logic is entirely wrong. And it’s our friends at the Bowl Championship Series that deserve the blame. Because their subjective ranking system means everything, we (and the computers) must try to figure out who has the best team(s). We have to do this because the match-up in the championship game depends on figuring it out. Hence, the speculation. But there is a major problem with this. As much as we try, the sport of football is not set up to divine who is the better team based on one single game alone. The sample size is insufficient. We draw a conclusion that Boise State is just as good or better than Oklahoma because they beat them in one game. But in reality, the only conclusion we are allowed to draw from that magical Fiesta Bowl is that Boise State scored more points than Oklahoma did by the time the game ended. Yet this is what college football forces us to do week in and week out — and I can’t take it anymore. Last season, TCU played as perfect a regular season as you could play against as strong a schedule as you could ask for, excepting the SEC schedule. And instead of getting a shot at the national title, they got shafted to play Boise State in the Fiesta Bowl. Then, when they lost, everyone used it as proof that climate change was bogus — that they weren’t a good team after all. Their entire season must have been a fluke since they lost a game. Using one game to draw valuations and conclusions about teams as a whole is (and this is important) so unbelievably pointless. But we have to. It’s college football. There’s no playoff. It’s unavoidable. But that’s not entirely true. There is one way to avoid it. Watch football on Sunday. In the blessed world of professional football, there are no subjective rankings. There are no “style points” and margin of victory analysis. There are no conclusions drawn about one team beating another aside from the winning team simply scored more points than the losing team. Every team has a one-in-four chance of winning their division and making the playoffs — and some are even invited in as a wild card in case they don’t. When the defending champion Saints lost at home to lowly Cleveland two weeks ago, their season was not over. They are still in the race for their division and firmly in control of their own destiny. Compare that with the crushing effects of BYU’s loss to Florida State last year, just two weeks after beating Oklahoma. In the refreshing land of the NFL, a win is what it was meant to be — a reflection of who was the better team on that day. Not a means of building up your resume in order to make the case that you’re hypothetically better than everyone else, so you can play in a championship game decided by a computer that takes into account whether you beat your opponent by enough points and with enough flash. Being hypothetically better means nothing in the NFL. Just ask the hypothetically better Indianapolis Colts after the clock read all zeroes at last years’ Super Bowl. No one was up in arms claiming the Colts were unmotivated but were still the better team in actuality. All of that conjecture would have been comically pointless. Yet, in college football, that kind of postulating is what fills much of what we discuss on a daily and weekly basis. It will form the foundation of the discussion this season as we await the computer results regarding whether yet another undefeated team from a small conference deserves to play for the national championship over a one-loss BCS conference team. And no matter what happens, some people will be unhappy and unfulfilled. For those of us seeking a bit of rationality in our football experience, the NFL provides the objective breath of fresh air. 1At the time of writing, Alabama was still a one-loss team. They have since lost to LSU, making this conversation a little outdated. But it is still an accurate representation of the logic involved in college football debates, so it stayed. Long overdue, but better late than never: The crew bids farewell to one member as Jake Welch prepares for a summer full of hair products and Yankees talk in New York City. The boys go out with a bang in this hourlong discussion of the ongoing NBA playoffs (lots of NBA playoffs), Michael Loyd, Jr.’s departure from the BYU basketball program, a little Major League Baseball, Ben Wagner’s penchant for bandwagon-jumping, and much, much more. Help us (temporarily) say goodbye to an old friend by listening below. Enjoy! SPORTS: Podcast: BYU Basketball vs. Utah (Part I), Super Bowl and More! The PB&J Report returns with more BYU Basketball talk and a recap of the Cougs’ first tussle (literally) of the year with The Team From Up North, as well as some Super Bowl talk. Enjoy! In our second sports podcast, Jake Welch, Ben Wagner, Preston Johnson and Steve Pierce rap about the weeks big topics, including last weekend’s big BYU-Utah football game, Max Hall’s controversial post-game comments, and even a little NFL mixed in. We’ve mostly corrected the audio problems from last week, but we’re still trying to master the art of sound levels, so bear with us on any inconsistencies. We’ll continue our quest to perfect the sweet science of podcasting next week. As always, thanks for reading — and enjoy! Holy smokes, people! It’s time for football! Since my last (and first) post, the Jazz have done nothing with Carlos Boozer and for good reason. I really hope I’m not the only one who thinks, and knows, that the Jazz are a much better team with him than without him. Let him leave after the season if he wants, but if the Jazz trade him they’ll be lucky to be the 8th seed in the west. They’d be lucky to be the 8th seed in the east. But I’m not talking Jazz or basketball today. I’m more excited for football this year than I ever remember being. And let me tell you, it’s not because I thought BYU would go undefeated and bust the BCS. In fact, nobody had any reason to believe that they would. And so we’ve reached my first topic, apparently. BYU football. I love watching BYU’s offense, and occasionally they’ve been able to put a pretty good defense on the field but, from what I had been hearing through fall camp, the Cougars would be fielding Frodo Baggins and Samwise Gamgee at cornerback, and their traveling mates Merry and Pippin at the safety positions. I heard one radio show caller who watched them practice refer to the defensive backs as “little piglets.” BCS, here we come! I sure wasn’t counting on it. I was 100% convinced that Oklahoma was going to wipe the floor with the questionable Cougar defense. Personally, I wasn’t doubting BYU’s secondary because they were unknown. I merely questioned their ability to be shut-down defenders, because I’m quite certain BYU has never had a shut-down defensive back. Last season Oklahoma scored over 60 points in 5 straight games! Only thrice did they score less than 40, one of those times being a 35-10 win over TCU, another a 45-35 loss to Texas, and the other a 24-14 loss to Florida in the BCS title game. Oklahoma’s receivers were huge and fast — exactly the opposite of BYU’s defensive backs, who are always short and slow. But this time BYU went pound-for-pound and step-for-step with an Oklahoma offense that looked stagnant and timid. Sam Bradford was the unfortunate recipient of a beautiful pass-rush scheme that sent Coleby Clawson flying through the line of scrimmage untouched, ready to use Bradford as a tackling dummy. The Cougars, despite four turnovers, ten penalties, and trailing the whole game, played tough and never quit. It was the relentless defense that seemed to inspire the brilliant fourth quarter scoring drive by the offense that consumed nearly nine minutes of the game clock. Max Hall was incredible on the drive and Dennis Pitta made huge catches to keep BYU in possession. I had to laugh though when Mckay Jacobson caught the go-ahead touchdown pass, but didn’t quite realize what had just happened. If you were to go back to watch a replay of the touchdown, Jacobson catches the ball then simply turns to walk toward the goal post and, after a couple steps, I think the magnitude of the play hit him and he began the fist-pumping and celebrating with teammates. Congratulations to the BYU Cougars for an incredible win. I’ve already heard more than one nationally known sports commentator talk about BYU’s excellent chances of playing in the BCS National Championship game. I can smell the growing hype, but I won’t get too caught up in it. I offer fans this piece of advice: Like the players, take this season one game at a time. Florida State, TCU and Utah are going to be very difficult opponents. But should BYU run the table with this schedule, hello Pasadena. Florida State looked beatable last weekend, even though they scored 34 points. The environment will be nothing short of an electrical storm and the Cougars will be eager to put on a show for the home fans. BYU should win. A lot of people seem to be assuming that because TCU comes to Provo this year, BYU will win. Before Saturday, I didn’t see any reason why TCU can’t handle BYU the same way they did last year. They’re almost exactly the same team, and they’ve got the best shot of anyone in the MWC to go undefeated this year. They’ve got weaker non-conference opponents than BYU, but going undefeated puts them in the BCS. TCU was able to dominate BYU last year because of their ability to spread the defense. When TCU came out with four or five receivers, the Cougar defense was lost. Utah possesses that same ability. Realistically, BYU still has three scary games on the schedule. Luckily, they’re all home games. The rest of the conference games should be fairly easily won. Speaking of Utah, I was excited to see who ended up being Utah’s full-time quarterback. A true freshman in Jordan Wynn and JC transfer Terrence Cain have been battling it out since the spring and, while Wynn was named first string going into fall camp, Cain was named the starter to open the season against Utah State. Certain logic would say that if the race is this close when there’s a freshman involved, you start the freshman and head straight ahead into the future. Others would say to start the guy who’s played some kind of college football before. Cain was very impressive in his Ute debut, completing, I believe, something like 20 of 30 passes for over 300 yards. I’m glad to see that there will likely be no quarterback shuffle at the U. There were a few seasons in which Utah was constantly making changes at quarterback, and from game-to-game nobody was sure who would lead the Utes on the field or how well that quarterback would perform. I believe Kyle Whittingham will pick one guy and stick with him, barring a complete disaster two or three games into the season. Even with a brand new quarterback, I believe the Utes will be right in the mix of the MWC championship race, although they probably won’t win it. Not til next year at least. Maybe. Either way, the Utes will probably continue to offer some high-flying offense, savagery on defense, and be just as exciting to watch as almost any spread offense in college football. I know I sure enjoyed watching them against the Aggies. It just so happens that I also love the NFL. I even enjoy everything that goes on during the offseason: Rookies, trades, free-agents, even new uniforms. By the way, the 49ers will be donning the uniforms of the glory days from now on, and I love it. Unfortunately, they will not have No. 10 overall draft pick Michael Crabtree, because he’s a baby and doesn’t think $20 million is enough money for him. I’m waiting for his head to pop out of his backside and announce “April fools,” even though it’s August. I would play football for $20 and he won’t play unless he gets more. If he doesn’t sign, he’ll be eligible to enter the NFL draft again next year. He can’t be stupid enough to think he’ll get drafted higher than tenth next year after not playing football for an entire year! Or can he be? Now that I mention stupid — I heard a rather disappointing SportsCenter update on ESPN Radio a couple weeks ago. After several baseball scores, the person giving the update proceeded onto the NFL, stating something along the lines of “Tom Brady left tonight’s game against the Redskins with a sore shoulder after being hit by defensive tackle Albert Haynesworth.” (That is not a direct quote, but it’s the same general statement.) And that was it. So, what I can take from that update is that, although it was just a meaningless preseason game, nothing from the game was even worth mentioning, including the score, besides poor li’l Tom Brady’s shoulder. I’ll bet Tom Brady didn’t even care about his shoulder “injury” as much as the ESPN people did. Perhaps it would have been more relevant had the injury been to the same foot that kept him on the sideline all of last season. I was just curious as to the outcome and maybe some statistics from that game. Can anyone help me out with that? Maybe I should try another sports network? By the way, Brady’s shoulder is fine. Elsewhere in the NFL, Michael Vick is back in football after signing a deal with the Philadelphia Eagles. I won’t say much about this, because my opinion is simple and I’m tired of hearing about it every day in sports talk radio. Michael Vick did horrible things to dogs and it makes me sick that so many are dead because of his dog fighting ring. But he took responsibility, served his prison sentence, apologized many times (whether or not I buy into the sincerity of said apologies is irrelevant), and now he is Donovan McNabb’s back-up. Hopefully everyone will stop talking about dog fighting and sit back to enjoy the dynamic he brings to the Eagles’ offense. He’ll play receiver on occasion, run some plays at quarterback and do anything else he’s asked, just to prove he wants nothing more than to win back any fans he most likely lost. To that I say God bless you, Michael Vick, for picking yourself up after being in some serious dumps (although self-inflicted) and getting back out on the field to continue pursuing your lifelong dream of playing in the NFL. How many of us would assume that nobody would want us and not even try? I’m not calling Vick a hero; He’s not even a future Hall of Famer. I’m only saying I admire his drive to come back and face the NFL. Let’s hope his bad choices of such magnitude are behind him. It would be a shame for the league to lose such an exciting player for good. And speaking of losing players — last but not least — I wish Brett Favre would go away. He needs to go find a cow to milk or some dudes in Wranglers to play mud-football with. I don’t think the Vikings are much better off with him. He’s thrown a ton of interceptions as of late and hasn’t been to a Super Bowl since 1997! Who is the guy telling the Vikings that Favre is a winner and that they can go all the way with him? After this season there won’t be such a guy, because he’ll get fired. I would like to quote a statement I’m just now making up in my head. “The last time Brett was in a Super Bowl was 12 years ago. He definitely knows how to win!” Somebody undoubtedly said something like that, and too many other people believed that person. I’m not a Vikings fan, or even a fan of a rival team, so I don’t really care from that perspective. I’m just tired of so much attention being broadcast onto one super-old guy who blames every interception on his shoulder, instead of the fact that he dances in the pocket and throws off his back foot all the time. One day we will be free of Brett Favre, and he can go back to his Mississippi mansion and play catch with his late-20′s Wrangler buddies to pass the time until he enters the Hall of Fame. In the meantime, I would like to watch Jay Cutler, Aaron Rodgers, Kurt Warner, Matt Cassel, Ben Roethlisberger, Tom Brady, Philip Rivers and Peyton Manning. Some are the great ones of the present, others are the great ones of the future — and Brett Favre was the great one of 1996. Adam Stevens is an occasional sports correspondent for Rhombus. There’s nothing better than Brett Favre endorsing jeans sold exclusively at Wal-Mart. Pure class. Three years ago, Mike Vick was on top of the world. The Atlanta Falcons quarterback was living the dream as one of the highest paid players in the NFL and had many successful years of football ahead of him. He was playing for a legitimate playoff contender and the city of Atlanta was eating out of his hand. To top it all off, he was the focus of one of the best commercials in recent history. I’m sure you remember seeing it: A scrawny little pip squeak gets strapped into a padded harness and goes for a ride on the “Michael Vick Experience.” He gets to feel what it’s like to dodge defensive ends, sprint past linebackers and flip over safeties. Three years later, this commercial has become a reality: the life of Michael Vick has now become a figurative roller coaster. After reaching such great heights, he has now hit the lowest of the low. Serious jail time, bankruptcy, unemployment: these are the realities the once great Vick now faces. 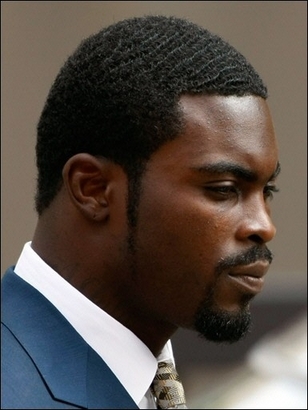 Now that he is out of jail and done with his house arrest, Vick is looking to make his way back to the NFL. NFL Commissioner Rodger Goodell has suspended Vick until the sixth week of the upcoming season, but there is the possibility he could be on the field sooner. While the actual length of the suspension is still in question, the real quandary is which team (if any) will take a risk on Vick. There have been many teams with a reported interest, but every time a GM is approached about the issue, they steer clear. No organization is willing to take that kind of P.R. risk at this point. There is someone, however, that has accepted Mike and he very well could be the key to the player’s future, on and off the field. That person is Tony Dungy. Some might ask why one of the most respected men in the NFL would connect himself with a troubled person like Vick. That’s just who Tony is. A devout Christian, Dungy has always been about doing good. He has been a constant supporter of numerous clubs and organizations and his service has been recognized by both Presidents George W. Bush and Barack Obama. This situation is a perfect example of a man practicing what he preaches. Instead of seeing Vick as an immature delinquent who could be considered hazardous material, Dungy saw an opportunity to help a young man in need. While Vick was in prison in Leavenworth, Dungy made a few visits to give the troubled quarterback some advice. Dungy talked to him about his faith and what he could be facing upon returning to society. He urged Vick to stay in touch and to keep him updated. Making the first of hopefully many good decisions, Vick continued communication with his new found mentor. Now Vick is back in the real world and Dungy is right there to help him through. Recently, Dungy met with his protege, not to discuss his looming suspension or what he needs to do to train, but to talk about his family and how he is doing as a father. That’s something we need more of in the NFL — and in life. For the next few weeks, the sporting world will be abuzz with rumors of possible teams for the formerly sensational Mike Vick. The Vikings, Jets and Seahawks remain his most likely destinations. However, even with his vast potential, Mike Vick will be seen as more a risk than a reward. Organizations fear the reaction of their fan base and the constant harassment of PETA; But if players like Ricky Williams, Onterrio Smith and Sebastian Janikowski can find work after their criminal activity, then Mike Vick deserves a shot to clear his name and move on with his life. There is no doubt that what he did was wrong, but he has served his time and done everything necessary to return to the game. If anything, these teams need to take a page from Tony Dungy’s life playbook and give the man a chance. It’s the right thing to do. Jake Welch is a sports writer for Rhombus. He recently learned that you can get away with anything in America — except organizing dog fights. Follow him on Twitter @jraywelch.